This is another view from a photo I posted earlier. On the right hand side you can see an orange area which is the center of the flower. You can also see a couple of white petals in the background. 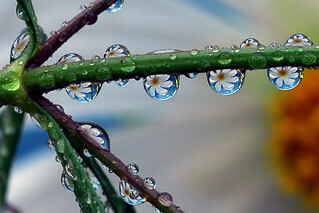 All of the waterdrops are acting as a natural lens, and refracting that same flower.